As I read about Romans 8:28 I was reminded of God‘s comforting truths to us..
~ that the things we most resented can be turned by God as our greatest triumph..
~ that life is not a problem to be solved but a work to be made..
~ because God knows what’s best for us and He wants to give that to you and me. It is true because we know God and He has said it. His word is trustworthy and that guarantees His promise. Indeed, His character rests upon it. We know because we know Him. We know not by looking at the events of our life but by knowing our God..
We may ask.. Why is this? Why does God do things this way? We don’t know at this time. His thoughts are not our thoughts. We have only limited understanding of His methods and purposes. Later, we will understand it all, when He is ready for us to have this understanding. ways my ways, saith the LORD. Romans 8:28 has often been a word of hope for me, assuring me that all things, even “bad” things, “work out” for people who love God. When I’m worried and in fear, or my faith is tested.. I am reminded that God is in control and He will never fail. 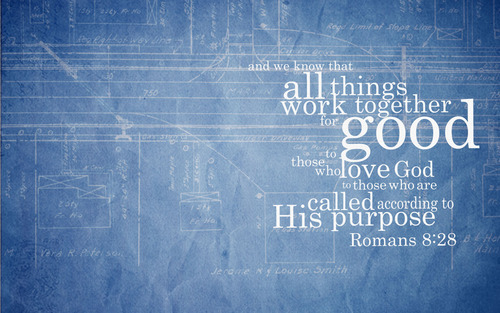 The comforting truth of Romans 8:28 is based especially on God’s sovereignty. If all things work together for good (all events, all circumstances, all trials, all happenings, every area of our life, etc. ), then it follows that God must be over all things whatsoever and must control all things. He has power over all things. He gives whatever He chooses to whomever He pleases. Nothing exists or occurs without His permission. This is the wonderful fact that an all-wise, all-loving, just God is in complete control of all things! So we can declare and rest in the fact that if we love God, and we are living in obedience to Him, He will grant us the desires of our hearts. And we can claim and declare that indeed, amidst any situation we may be in to…we can say to God… THAT IN ALL THINGS YOU WILL WORK FOR OUR GOOD BECAUSE WE LOVE YOU AND WE HAVE BEEN CALLED ACCORDING TO YOUR PURPOSE..giving glory unto your name.